Enabled / Checked When the machine goes into sleep mode the device power state is changed from D0 to D3 (sleep). Disabled / Unchecked When the machine goes into sleep mode the device power state is changed from D0 to D4 (off). Strangely enough later on the same article explains that by setting a certain registry value (PnPCapabilities) to 24 it will prevent Windows from turning off the network adapter (and use Wake-on-LAN). Either way, I created the script and applied it. So I wrote a PowerShell script that queries all available WiFi adapters and disables the Allow the computer to turn off the device to save power. The script runs without arguments but requires elevated privileges, this is enforced by the script. With special thanks to Ward Sprewers for the tip! I like your handy script, just wondering if you have a similar script that will do the same for the Lan NIC. I have clients that after sleep mode, lose there mapped drives. I relatively new to powershell. Any help would be great. I need a script which will leave the LAN Adapter Network Cards (NIC or other words Ethernet) in the D3 state and able to do Wake On LAN from the Complete Shutdown State (S5). If you need to do a higher Dx state such as D0 that is fine with me. I am using a Windows 8.1 Pro computer. I used to be able to do Wake On LAN but at some point (I believe when I went to Windows 8.1 that capability stopped working). 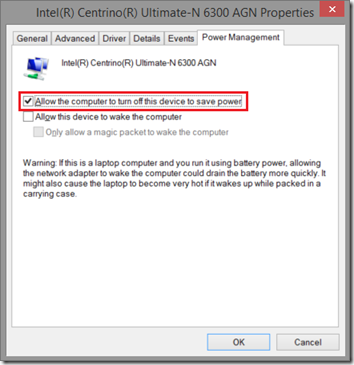 I believe now when Windows does shutdown, Windows puts the LAN Adapters into complete power off state as I cannot not see any lights on the Network Controller Port/Connector. Thanks. What would need to be done to disable this for Wifi and LAN adapters? I’ve just updated the article to explain the change in the script. Is this working for WIN10 ? Its been working for me on win10 pro. Hi! How can we achieve the same using GPP in active directory for all company computers? Why would anyone create this stupid setting? No one wants their network adapter to turn off whenever it feels like it. That’s just plain stupid. It never ceases to amaze me how a corporation of super geniuses like Intel and Microsoft can be such morons at the same time. They just need to quit screwing with people’s machines and leave well enough alone. The statement from Verheij that when the Wi-Fi Adapter is in D3 state that it is in a sleep state I believe to be a false statement. First the D3 State is applicable to the LAN Adapter not the Wi-Fi State. My research in the past has indicated that the D3 state is considered to actually be the lowest power state of a LAN Adapter of which the purpose seems to be to allow the LAN Adapter to have enough power to respond to a special data packet or ‘Magic Packet’ allowing the LAN Adapter to turn on power to the motherboard to bring the computer out of an S5 Shutdown State. 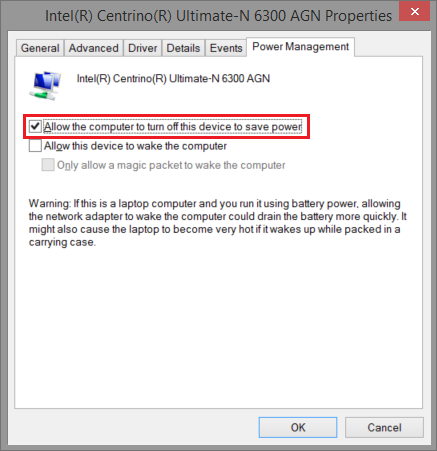 The S5 (Shutdown State) is not actually treated like a sleep state but rather is considered the complete Shutdown state of a computer and generally thought to be the powered off state except for the power necessary to keep the BIOS, Battery, Clock, etc. running or in other words much like a Standby State but it is not in Sleep. Windows 10 and possibly earlier has done something to apparently kill all power to the LAN Adapters (meaning I do not see the Data Lights and ‘Link’ light I believe it is called) and therefore I am assuming this means there is no power going to the LAN Adapter and without any power to the LAN Adapters the ‘Magic Packet’ cannot power up the computer. How Windows 10 accomplishes this I do not know but prior to this one could power on remotely a Windows computer by sending a ‘Magic Packet’ to the Windows computer’s LAN Adapter. I agree Microsoft should not be interfering with the way in which we control our computers in this manner. Microsoft should not be taking away functionality our computers have which we prefer to make use of. Microsoft is becoming too much like Apple in this regards. Then i change and will remove and with script its working now.